Physician to three American Presidents, he died on January 2, 1991 at Nazarath House, a nursing home in Los Angeles at the age of 88. He died of pneumonia. He specialized in internal medicine and cardiology, and served as the personal doctor to Presidents John F. Kennedy and Lyndon B. Johnson and was the doctor-in-charge at the Navy-operated Presidentail retreat at Camp David, Maryland, when President Dwight D. Eisenhower was there. He accompanied Eisenhower on an 11-nation tour of the far east in 1959. He joined the White House medical staff in 1961 as an assistant to Dr. Janet G. Travell, White House Physician. In August 1961, he was promoted from Captain to Rear Admiral and shortly thereafter began accompanying Kennedy on all of his trips. In July 1963, after publication of the Government Organization Manual listing his title as White House Physician, it was confirmed that he had been named Kennedy's personal doctor and that Travell had stepped down. On November 22, 1963, he was in the Presidential motorcade in Dallas, riding behind the President's limousine, when Kennedy was fatally shot. When he arrived at Parkland Hospital, Kennedy was undergoing emergency treatment and he was unable to assist. After Johnson was sworn in as President, he was appointed his personal doctor. Promoted to Vice Admiral in 1965, he helped nurse Johnson through colds and surgeries, including a highly secret operation for cancer in 1967. It was not until 1977, after Burkley had denied published reports of the operation, that a Navy spokesman confirmed that Johnson had undergone surgery for skin cancer on his left ankle. He retired in January 1969, at the end of the Johnson Administration. He was a graduate of the University of Pittsburgh Medical School and served as a Navy Lieutenant Commander in the South Pacific during World War II and was later assigned to naval hospitals before becoming head of the Navy Dispensary in Washington, D.C. in 1957. He is buried in Section 5 of Arlington National Cemetery. 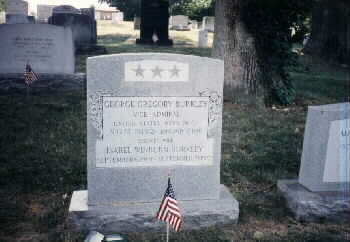 His wife, Isabel Winburn Burkley (September 6, 1907-September 10, 1972), is buried with him. Mrs. Isabel Winburn Burkley, 65, formerly of Kalamazoo, Michigan, died Tuesday at Bethesda Naval Hospital, Bethesda, Maryland. Mrs. Burkley was the wife of Vice Admiral George Burkley, U.S. Navy (ret. ), of Blairsville, Pennsylvania, who was the personal physician to Presidents Dwight Eisenhower, John F. Kennedy and Lyndon Johnson. family. Her mother resides there. Mrs. Burkley married in Erie in 1933 then moved to Pittsburgh where she and her husband resided until World War II. A graduate of Vassar, she was the treasurer of the Navy Relief Fund of Washington, D.C.
Four children survive. Funeral services will be held at 10:45 a.m. Monday at Fort Myer Chapel, Arlington National Cemetery. Burial will be in Arlington Cemetery. source: Kalamazoo Gazette Thursday, 21 September 1972.